Both David Henderson and Scott Sumner had some fun with this declaration of victory on behalf of Austrian Business Cycle Theory by Robert Murphy after the recent mini-stock-market crash. As shocking as these developments [drops in stock prices and increased volatility] may be to some analysts, those versed in the writings of economist Ludwig von Mises have been warning for years that the Federal Reserve was setting us up for another crash. While it’s always tempting to join in the fun of mocking ABCT, I am going to try to be virtuous and resist temptation, and instead comment on a different lesson that I would draw from the recent stock market fluctuations. Austrians aren’t the only ones who think they have something useful to say about future trends in asset prices. Keynesians and others also like to talk about “bubbles”, which I take as an implied prediction that the asset will do poorly over an extended period of time. If not, what exactly does “bubble” mean? I think this is all foolish; assume the Efficient Markets Hypothesis is roughly accurate, and look for what markets are telling us about policy. First, Nobel laureate Robert Shiller was awarded the prize largely for work showing that stock prices exhibit excess volatility. The recent sharp fall in stock prices followed by a sharp rebound raise the possibility that stock prices have been fluctuating for reasons other than the flow of new publicly available information, which, according to EMH, is what determines stock prices. Shiller’s work is not necessarily definitive, so it’s possible to reconcile EMH with observed volatility, but I think that there are good reasons for skepticism. Second, there are theories other than EMH that predict or are at least consistent with stock prices following a random walk. A good example is Keynes’s discussion of the stock exchange in chapter 12 of the General Theory in which Keynes actually formulated a version of EMH, but rejected it based on his intuition that investors focused on “fundamentals” would not have the capital resources to finance their positions when, for whatever reason, market sentiment turns against them. According to Keynes, picking stocks is like guessing who will win a beauty contest. You can guess either by forming an opinion about the most beautiful contestant or by guessing who the judges will think is the most beautiful. Forming an opinion about who is the most beautiful is like picking stocks based on fundamentals or EMH, guessing who the judges will think is most beautiful is like picking stocks based on predicting market sentiment (Keynesian theory). EMH and the Keynesian theory are totally contrary to each other, but it’s not clear to me that any of the tests mentioned by Scott (random fluctuations in stock prices, index funds outperforming managed funds, excess returns not serially correlated) is inconsistent with the Keynesian theory. Third, EMH presumes that there is a direct line of causation running from “fundamentals” to “expectations,” and that expectations are rationally inferred from “fundamentals.” That neat conceptual dichotomy between objective fundamentals and rational expectations based on fundamentals presumes that fundamentals are independent of expectations. But that is clearly false. The state of expectations is itself fundamental. Expectations can be and often are self-fulfilling. That is a commonplace observation about social interactions. The nature and character of many social interactions depends on the expectations with which people enter into those interactions. I may hold a very optimistic view about the state of the economy today. But suppose that I wake up tomorrow and hear that the Shanghai stock market crashes, going down by 30% in one day. Will my expectations be completely independent of my observation of falling asset prices in China? Maybe, but what if I hear that S&P futures are down by 10%? If other people start revising their expectations, will it not become rational for me to change my own expectations at some point? How can it not be rational for me to change my expectations if I see that everyone else is changing theirs? If people are becoming more pessimistic they will reduce their spending, and my income and my wealth, directly or indirectly, depend on how much other people are planning to spend. So my plans have to take into account the expectations of others. An equilibrium requires consistent expectations among individuals. If you posit an exogenous change in the expectations of some people, unless there is only one set of expectations that is consistent with equilibrium, the exogenous change in the expectations of some may very well imply a movement toward another equilibrium with a set of expectations from the set characterizing the previous equilibrium. There may be cases in which the shock to expectations is ephemeral, expectations reverting to what they were previously. Perhaps that was what happened last week. But it is also possible that expectations are volatile, and will continue to fluctuate. If so, who knows where we will wind up? EMH provides no insight into that question. I started out by saying that I was going to resist the temptation to mock ABCT, but I’m afraid that I must acknowledge that temptation has got the better of me. 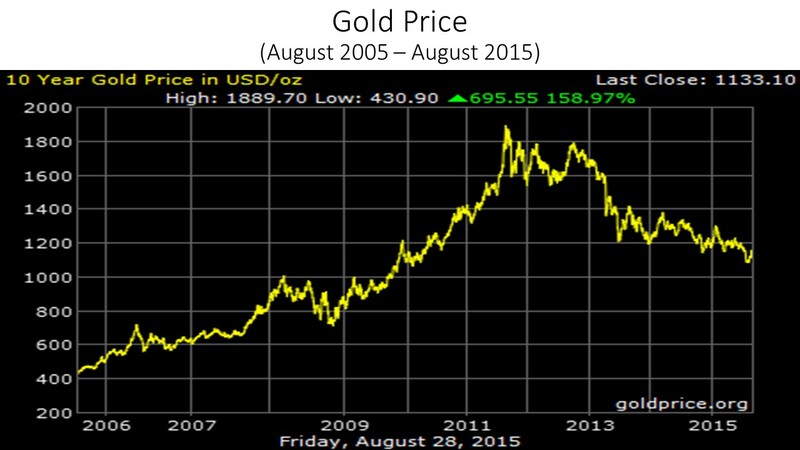 Here are two charts: the first shows the movement of gold prices from August 2005 to August 2015, the second shows the movement of the S&P 500 from August 2005 to August 2015. 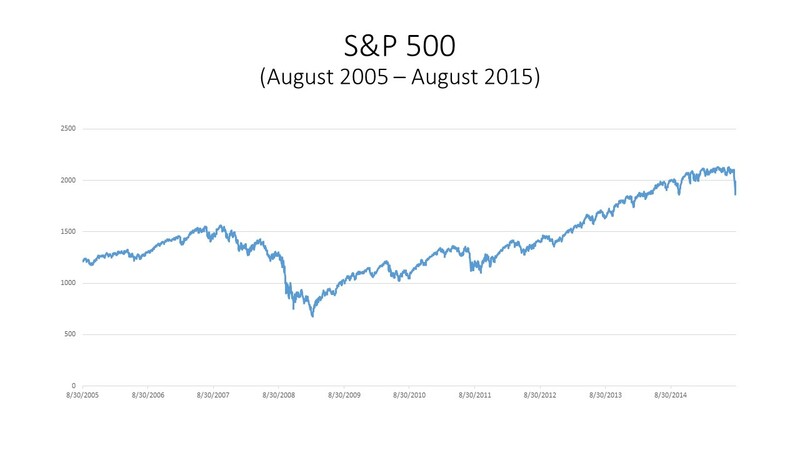 I leave it to readers to decide which chart is displaying the more bubble-like price behavior. While searching for material on the close and multi-faceted relationship between Keynes and Hawtrey which I am now studying and writing about, I came across a remarkable juxtaposition of two reviews in the British economics journal Economica, published by the London School of Economics. Economica was, after the Economic Journal published at Cambridge (and edited for many years by Keynes), probably the most important economics journal published in Britain in the early 1930s. Having just arrived in Britain in 1931 to a spectacularly successful debut with his four lectures at LSE, which were soon published as Prices and Production, and having accepted the offer of a professorship at LSE, Hayek began an intense period of teaching and publishing, almost immediately becoming the chief rival of Keynes. The rivalry had been more or less officially inaugurated when Hayek published the first of his two-part review-essay of Keynes’s recently published Treatise on Money in the August 1931 issue of Economica, followed by Keynes’s ill-tempered reply and Hayek’s rejoinder in the November 1931 issue, with the second part of Hayek’s review appearing in the February 1932 issue. But interestingly in the same February issue containing the second installment of Hayek’s lengthy review essay, Hayek also published a short (2 pages, 3 paragraphs) review of Hawtrey’s Trade Depression and the Way Out immediately following Hawtrey’s review of Hayek’s Prices and Production in the same issue. So not only was Hayek engaging in controversy with Keynes, he was arguing with Hawtrey as well. The points at issue were similar in the two exchanges, but there may well be more to learn from the lower-key, less polemical, exchange between Hayek and Hawtrey than from the overheated exchange between Hayek and Keynes. Hayek on Trade Depression and the Way Out. Hayek, in his usual polite fashion, begins by praising Hawtrey’s theoretical eminence and skill as a clear expositor of his position. (“the rare clarity and painstaking precision of his theoretical exposition and his very exceptional knowledge of facts making anything that comes from his pen well worth reading.”) However, noting that Hawtrey’s book was aimed at a popular rather than a professional audience, Hayek accuses Hawtrey of oversimplification in attributing the depression to a lack of monetary stimulus. Hayek proceeds in his second paragraph to explain what he means by oversimplification. Hayek agrees that the origin of the depression was monetary, but he disputes Hawtrey’s belief that the deflationary shocks were crucial. [Hawtrey’s] insistence upon the relation between “consumers’ income” and “consumers’ outlay” as the only relevant factor prevents him from seeing the highly important effects of monetary causes upon the capitalistic structure of production and leads him along the paths of the “purchasing power theorists” who see the source of all evil in the insufficiency of demand for consumers goods. . . . Against all empirical evidence, he insists that “the first symptom of contracting demand is a decline in sales to the consumer or final purchaser.” In fact, of course, depression has always begun with a decline in demand, not for consumers’ goods but for capital goods, and the one marked phenomenon of the present depression was that the demand for consumers’ goods was very well maintained for a long while after the crisis occurred. Hayek’s comment seems to me to misinterpret Hawtrey slightly. Hawtrey wrote “a decline in sales to the consumer or final purchaser,” which could refer to a decline in the sales of capital equipment as well as the sales of consumption goods, so Hawtrey’s assertion was not necessarily inconsistent with Hayek’s representation about the stability of consumption expenditure immediately following a cyclical downturn. It would also not be hard to modify Hawtrey’s statement slightly; in an accelerator model, with which Hawtrey was certainly familiar, investment depends on the growth of consumption expenditures, so that a leveling off of consumption, rather than an actual downturn in consumption, would suffice to trigger the downturn in investment which, according to Hayek, was a generally accepted stylized fact characterizing the cyclical downturn. [W]hat Mr. Hawtrey, in common with many other English economists [I wonder whom Hayek could be thinking of], lacks is an adequate basic theory of the factors which affect [the] capitalistic structure of production. [Hawtrey] seems to extend [blame for the depression] on the policy of the Bank of England even to the period before 1929, though according to his own criterion – the rise in the prices of the original factors of production [i.e., wages] – it is clear that, in that period, the trouble was too much credit expansion. “In 1929,” Mr. Hawtrey writes, “when productive activity was at its highest in the United States, wages were 120 percent higher than in 1913, while commodity prices were only 50 percent higher.” Even if we take into account the fact that the greater part of this rise in wages took place before 1921, it is clear that we had much more credit expansion before 1929 than would have been necessary to maintain the world-wage-level. It is not difficult to imagine what would have been the consequences if, during that period, the Bank of England had followed Mr. Hawtrey’s advice and had shown still less reluctance to let go. But perhaps, this would have exposed the dangers of such frankly inflationist advice quicker than will now be the case. A remarkable passage indeed! To accuse Hawtrey of toleration of inflation, he insinuates that the 50% rise in wages from 1913 to 1929, was at least in part attributable to the inflationary policies Hawtrey was advocating. In fact, I believe that it is clear, though I don’t have easy access to the best data source C. H. Feinstein’s “Changes in Nominal Wages, the Cost of Living, and Real Wages in the United Kingdom over Two Centuries, 1780-1990,” in Labour’s Reward edited by P. Schoillers and V. Zamagni (1995). From 1922 to 1929 the overall trend of nominal wages in Britain was actually negative. Hayek’s reference to “frankly inflationist advice” was not just wrong, but wrong-headed. Hawtrey spends the first two or three pages or so of his review giving a summary of Hayek’s theory, explaining the underlying connection between Hayek and the Bohm-Bawerkian theory of production as a process in time, with the length of time from beginning to end of the production process being a function of the rate of interest. Thus, reducing the rate of interest leads to a lengthening of the production process (average period of production). Credit expansion financed by bank lending is the key cyclical variable, lengthening the period of production, but only temporarily. Some intermediate products (“non-specific”) can readily be transferred from one process to another, but others (“specific”) cannot. These latter will no longer be needed. Those who have been using them, and still more those who have producing them, will be thrown out of employment. And here is the “explanation of how it comes about at certain times that some of the existing resources cannot be used.” . . . The originating cause of the disturbance would therefore be the artificially enhanced demand for producers’ goods arising when the creation of credit in favour of producers supplements the normal flow savings out of income. It is only because the latter cannot last for ever that the reaction which results in under-employment occurs. But Hawtrey observes that only a small part of the annual capital outlay is applied to lengthening the period of production, capital outlay being devoted mostly to increasing output within the existing period of production, or to enhancing productivity through the addition of new plant and equipment embodying technical progress and new inventions. Thus, most capital spending, even when financed by credit creation, is not associated with any alteration in the period of production. Hawtrey would later introduce the terms capital widening and capital deepening to describe investments that do not affect the period of production and those that do affect it. Nor, in general, are capital-deepening investments the most likely to be adopted in response to a change in the rate of interest. Similarly, If the rate of interest were to rise, making the most roundabout processes unprofitable, it does not follow that such processes will have to be scrapped. A piece of equipment may have been installed, of which the yield, in terms of labour saved, is 4 percent on its cost. If the market rate of interest rises to 5 percent, it would no longer be profitable to install a similar piece. But that does not mean that, once installed, it will be left idle. The yield of 4 percent is better than nothing. . . . When the scrapping of plant is hastened on account of the discovery of some technically improved process, there is a loss not only of interest but of the residue of depreciation allowance that would otherwise have accumulated during its life of usefulness. It is only when the new process promises a very suitable gain in efficiency that premature scrapping is worthwhile. A mere rise in the rate of interest could never have that effect. But though a rise in the rate of interest is not likely to cause the scrapping of plant, it may prevent the installation of new plant of the kind affected. Those who produce such plant would be thrown out of employment, and it is this effect which is, I think, the main part of Dr. Hayek’s explanation of trade depressions. But what is the possible magnitude of the effect? The transition from activity to depression is accompanied by a rise in the rate of interest. But the rise in the long-term rate is very slight, and moreover, once depression has set in, the long-term rate is usually lower than ever. Changes are in any case perpetually occurring in the character of the plant and instrumental goods produced for use in industry. Such changes are apt to throw out of employment any highly specialized capital and labour engaged in the production of plant which becomes obsolete. But among the causes of obsolescence a rise in the rate of interest is certainly one of the least important and over short periods it may safely be said to be quite negligible. Hawtrey goes on to question Hayek’s implicit assumption that the effects of the depression were an inevitable result of stopping the expansion of credit, an assumption that Hayek disavowed much later, but it was not unreasonable for Hawtrey to challenge Hayek on this point. It is remarkable that Dr. Hayek does not entertain the possibility of a contraction of credit; he is content to deal with the cessation of further expansion. He maintains that at a time of depression a credit expansion cannot provide a remedy, because if the proportion between the demand for consumers’ goods and the demand for producers’ goods “is distorted by the creation of artificial demand, it must mean that part of the available resources is again led into a wrong direction and a definite and lasting adjustment is again postponed.” But if credit being contracted, the proportion is being distorted by an artificial restriction of demand. The expansion of credit is assumed to start by chance, or at any rate no cause is suggested. It is maintained because the rise of prices offers temporary extra profits to entrepreneurs. A contraction of credit might equally well be assumed to start, and then to be maintained because the fall of prices inflicts temporary losses on entrepreneurs, and deters them from borrowing. Is not this to be corrected by credit expansion? Dr. Hayek recognizes no cause of under-employment of the factors of production except a change in the structure of production, a “shortening of the period.” He does not consider the possibility that if, through a credit contraction or for any other reason, less money altogether is spent on intermediate products (capital goods), the factors of production engaged in producing these products will be under-employed. Hawtrey then discusses the tension between Hayek’s recognition that the sense in which the quantity of money should be kept constant is the maintenance of a constant stream of money expenditure, so that in fact an ideal monetary policy would adjust the quantity of money to compensate for changes in velocity. Nevertheless, Hayek did not feel that it was within the capacity of monetary policy to adjust the quantity of money in such a way as to keep total monetary expenditure constant over the course of the business cycle. In conclusion, I feel bound to say that Dr. Hayek has spoiled an original piece of work which might have been an important contribution to monetary theory, by entangling his argument with the intolerably cumbersome theory of capital derived from Jevons and Bohm-Bawerk. This theory, when it was enunciated, was a noteworthy new departure in the metaphysics of political economy. But it is singularly ill-adapted for use in monetary theory, or indeed in any practical treatment of the capital market. Once again, I find myself slightly behind the curve, with Scott Sumner (and again, and again, and again, and again), Nick Rowe and Bill Woolsey out there trying to face down an onslaught of Austrians rallying under the dreaded banner (I won’t say what color) of Cantillon Effects. At this point, the best I can do is some mopping up by making a few general observations about the traditional role of Cantillon Effects in Austrian business cycle theory and how that role squares with the recent clamor about Cantillon Effects. Scott got things started, as he usually does, with a post challenging an Austrian claim that the Federal Reserve favors the rich because its injections of newly printed money enter the economy at “specific points,” thereby conferring unearned advantages on those lucky or well-connected few into whose hands those crisp new dollar bills hot off the printing press first arrive. The fortunate ones who get to spend the newly created money before the fresh new greenbacks have started on their inflationary journey through the economy are able to buy stuff at pre-inflation prices, while the poor suckers further down the chain of transactions triggered by the cash infusion must pay higher prices before receiving any of the increased spending. Scott’s challenge provoked a fierce Austrian counterattack from commenters on his blog and from not-so-fierce bloggers like Bob Murphy. As is often the case, the discussion (or the shouting) produced no clear outcome, each side confidently claiming vindication. Scott and Nick argued that any benefits conferred on first recipients of cash would be attributable to the fiscal impact of the Fed’s actions (e.g., purchasing treasury bonds with new money rather than helicopter distribution), with Murphy et al. arguing that distinctions between the fiscal and monetary effects of Fed operations are a dodge. No one will be surprised when I say that Scott and Nick got the better of the argument. But there are a couple of further points that I would like to bring up about Cantillon effects. It seems to me that the reason Cantillon effects were thought to be of import by the early Austrian theorists like Hayek was that they had a systematic theory of the distribution or the incidence of those effects. Merely to point out that such effects exist and redound to the benefits of some lucky individuals would have been considered a rather trivial and pointless exercise by Hayek. Hayek went to great lengths in the 1930s to spell out a theory of how the creation of new money resulting in an increase in total expenditure would be associated with a systematic and (to the theorist) predictable change in relative prices between consumption goods and capital goods, a cheapening of consumption goods relative to capital goods causing a shift in the composition of output in favor of capital goods. Hayek then argued that such a shift in the composition of output would be induced by the increase in capital-goods prices relative to consumption-goods prices, the latter shift, having been induced by a monetary expansion that could not (for reasons I have discussed in previous posts, e.g., here) be continued indefinitely, eventually having to be reversed. This reversal was identified by Hayek with the upper-turning point of the business cycle, because it would trigger a collapse of the capital-goods industries and a disruption of all the production processes dependent on a continued supply of those capital goods. Hayek’s was an interesting theory, because it identified a particular consequence of monetary expansion for an important sector of the economy, providing an explanation of the economic mechanism and a prediction about the direction of change along with an explanation of why the initial change would eventually turn out to be unsustainable. The theory could be right or wrong, but it involved a pretty clear-cut set of empirical implications. But the point to bear in mind is that this went well beyond merely saying that in principle there would be some gainers and some losers as the process of monetary expansion unfolds. What accounts for the difference between the empirically rich theory of systematic Cantillon Effects articulated by Hayek over 80 years ago and the empirically trivial version on which so much energy was expended over the past few days on the blogosphere? I think that the key difference is that in Hayek’s cycle theory, it is the banks that are assumed somehow or other to set an interest rate at which they are willing to lend, and this interest rate may or may not be consistent with the constant volume of expenditure that Hayek thought (albeit with many qualifications) was ideal criterion of the neutral monetary policy which he favored. A central bank might or might not be involved in the process of setting the bank rate, but the instrument of monetary policy was (depending on circumstances) the lending rate of the banks, or, alternatively, the rate at which the central bank was willing lending to banks by rediscounting the assets acquired by banks in lending to their borrowers. The way Hayek’s theory works is through an unobservable natural interest rate that would, if it were chosen by the banks, generate a constant rate of total spending. There is, however, no market mechanism guaranteeing that the lending rate selected by the banks (with or without the involvement of a central bank) coincides with the ideal but unobservable natural rate. Deviations of the banks’ lending rate from the natural rate cause Cantillon Effects involving relative-price distortions, thereby misdirecting resources from capital-goods industries to consumption-goods industries, or vice versa. But the specific Cantillon effect associated with Hayek’s theory presumes that the banking system has the power to determine the interest rates at which borrowing and lending take place for the entire economy. This presumption is nowhere ot my knowledge justified, and it does not seem to me that the presumption is even remotely justifiable unless one accepts the very narrow theory of interest known as the loanable-funds theory. According to the loanable-funds theory, the rate of interest is that rate which equates the demand for funds to be borrowed with the supply of funds available to be lent. However, if one views the rate of interest (in the sense of the entire term structure of interest rates) as being determined in the process by which the entire existing stock of capital assets is valued (i.e., the price for each asset at which it would be willingly held by just one economic agent) those valuations being mutually consistent only when the expected net cash flows attached to each asset are discounted at the equilibrium term structure and equilibrium risk premia. Given that comprehensive view of asset valuations and interest-rate determination, the notion that banks (with or without a central bank) have any substantial discretion in choosing interest rates is hard to take seriously. And to the extent that banks have any discretion over lending rates, it is concentrated at the very short end of the term structure. I really can’t tell what she meant, but it is at least possible that Joan Robinson was alluding to this idea when, in her own uniquely charming way, she criticized Hayek’s argument in Prices and Production. At any rate, if interest rates are determined comprehensively in all the related markets for existing stocks of physical assets, not in flow markets for current borrowing and lending, Hayek’s notion that the banking system can cause significant Cantillon effects via its control over interest rates is hard to credit. There is perhaps some room to alter very short-term rates, but longer-term rates seem impervious to manipulation by the banking system except insofar as inflation expectations respond to the actions of the banking system. But how does one derive a Cantillon Effect from a change in expected inflation? Cantillon Effects may or may not exist, but unless they are systematic, predictable, and unsustainable, they have little relevance to the study of business cycles.